For the longest time, I considered myself unpatriotic. It stemmed from a complete disdain and disgust for how things always seemed to work in Nigeria. It wasn’t just the state of the country, it was unapologetic irresponsible behavior of most of those in power. I knew things could be better because from an early age, I was fortunate to spend my summer holidays in the western world and exposed to life in a developed environment. I wondered why Nigeria wasn’t the same. I mean, I learned in primary school that Nigeria has, apart from crude oil, arid land, bitumen, coal, gold and lots more. Nigeria has the makings of a super power, but remains an under-developed country. After the era of Nationalists like Nnamdi Azikwe, Tafawa Balewa, and Obafemi Awolowo, its leadership was consumed by insatiable greed – one after the other, looting millions of dollars from a non-dollar-spending economy, treating the national treasury as their personal piggy bank – to the detriment of their own people. I noticed the imbalance in wealth distribution from a tender age. The very first time the reality dawned on me, I was on my way to school, in an air-conditioned car, with my dad. As usual, beggars would approach the car for alms. However, on this particular day, an elderly beggar walked up to the car, put his palm on window, and caused a smudge. I remembered thinking, Yuck, didn’t he have his bath? Then, I started thinking about all the things he wouldn’t get to do – he probably would live his entire life without riding in a car, learning how to drive, being driven, or even enjoying a ride in an air-conditioned car, and none of it was his fault. It made me sick. As I got older, I realized, or rather, it seemed obvious things would never change. Coming to that conclusion, I felt Nigeria was a disaster, and like so many young people, wondered why I had to be born Nigerian, instead of being from somewhere in the United Kingdom or United States. I became so disconnected and didn’t want to have a thing to do with Nigeria. I never saw myself as someone interested in fixing things, but I grew into someone not even remotely interested in making things better. As far as I was concerned, I was simply whiling away time in Nigeria until it was time to finally leave, either through my Master’s or some act of God. I wasn’t even interested in learning to speak or understand any Nigerian language; I made an active effort not to. In fact, Yoruba was the constant red in a sea of blue or the only F in the midst of As in my results all through high school, and I was never fazed. My WAEC result was no different. At some point, I felt Nigeria was being ruled by people from impoverished backgrounds. That seemed to be the only logical reason why the moment these people got into positions of power, they would decide to alter/change the course of their future generations by shamelessly syphoning millions. I thought, if only Nigeria could have someone from a wealthy family, or at least, someone who could not be fazed by money, finally, things would work. I didn’t know how wrong I was. I left Nigeria to redo Grade 12 at Southern Ontario College (SOC) to increase my chances of getting into an ivy-league Canadian University. While at SOC, most of my classmates included those who had finished from schools like Atlantic Hall, Grange, Greensprings, Lagoon, Olashore and co. In my mind, these were the cream of the crop. There were few very government-educated people, except for me from Federal Government College Lagos (Ijanikin) and some ladies who finished from Queen’s College. I was finally among people that think like me, or at the very least, those with similar backgrounds. To my astonishment, during a conversation about whether or not to move back to Nigeria, one of the students I met there, who was quite possibly from one of the wealthiest families, said if he got into office, he would take his cut of the national cake. For those who may not be familiar with that phrase, he basically said he would loot too. I was shocked, especially because his father isn’t a politician or politically-connected, so what corrupted him? This was a pivotal point in my life. It became obvious to me that corruption transcends education or pedigree, it is a mindset; a mindset that had, unfortunately, already eaten into my generation. I was heartbroken. I lost faith in my generation, in Nigeria. I became more resolute in my desire/decision to not return. I loved my country, and I could see its potential, but I wasn’t going to waste my time figuring out how to make the lives of millions of people better when I wouldn’t be able to identify a sect of people I could trust or depend on. I got into McMaster University for a degree in Psychology, started a business in my first year, started another, and then a third business working as a Business Consultant. My life was taking shape rather nicely. In the course of doing business, I came across some concepts I thought could be real moneymakers in Nigeria, so decided to move back for a year or two. In the summer of 2014, I was blown away. En route to Nigeria, I stopped over in Dubai for an 18-hour layover. Right from the airport, you could already envision what’s to come. I had been through the airport a couple times before – Emirates is my favorite airline – but this would be my first time really taking a look around and leaving the airport for the city. As we being driven through parts of the city, I just shook my head in disbelief. The United Arab Emirates (UAE) is a country just like Nigeria. Well, it isn’t even like Nigeria because they don’t have as many resources as we do, but the one thing we do have in common, they have utilized for the maximum benefit of the Emiratis. I’ve heard people say “Oh, it’s Arab Money”, if you never knew, Nigeria has Arab Money. Nigeria is disgustingly, filthy rich, but some of our leaders won’t let the country be great. Can you imagine that? The UAE seeking advice from Nigeria. A little over 40 years later, Emirates is the world’s best airline and Nigeria Airways is defunct. What happened? I honestly believe Nigeria could be infinitely better than the UAE, not only because of its natural resources, but also because of its human capital – the largest in Africa (180 million people); instead, majority of its people are suffering, living in fear, begging for food, sleeping on the streets and under bridges, and dying from thirst, starvation and lack of basic amenities. What kind of a life are my people living? I read recently that Nigeria has surpassed India as having the most people living in extreme poverty in the world – a prediction given by World Poverty Clock barely a year ago. What a shame. It is pathetic the state this country is in. The average politician struggles to get into office simply to enrich him/herself, not the lives of the people who put their faith in him/her, the people who casted their one vote for him/her. They get into office and begin to misbehave, and if he/she is “magnanimous” enough to fix roads and provide basic amenities, people think he/she is a great person. I don’t dispute that such a person should be commended, but that’s the job they signed up for and what the resources at their disposal are meant for. A few weeks ago marked my fourth year back home. I’ve thought about returning to Canada several times. I can’t even tell you how many people have asked me why I came from Canada to Nigeria, when people are fleeing/leaving Nigeria for Canada! I won’t deny that there is a sense of comfort owning a British, Canadian, or even, for now, American residence papers, and living a comfortable life, but no offense to anyone uninterested in returning, I cannot be selfish anymore. I can no longer act like whatever happens here is none of my business. I see people who through the actions of visionless leaders, have no/poor education, no exposure, no prospects, no future. I care that the average Nigerian suffers daily just to survive, while their elected leaders live in paradise. Granted, every Nigerian cannot be wealthy, that’s just the way the world is – 1% own 99% of the world’s wealth and all that; my point is the quality of life and cost of living of most Nigerians can be better. I cannot stand idly as our leaders abuse and squander the resources and potential of our nation. This is not necessarily a campaign; anyone who knows me can testify that I’m most likely the least political person ever. Even if I were to campaign for anything in Lagos (I’m from Badagry), I can’t even speak Yoruba, not very well anyway, talk less of Egun lol. On a serious note though, ranting aside, I’m fed up and I just wonder if there are any youths like me out there – with a similar mindset and relatively strong moral compass – imagine what we could achieve if we band together. Things have got to improve (“change” has been marred by APC) and I certainly cannot do it all alone. This is more like an appeal. If you love this country and want the best of it, love your people, your family and want the best for them, let’s stand behind a candidate with integrity, with a vision, with a plan, with a moral compass. Life can be better in Nigeria if we, as responsible youths, back such a candidate. Let’s stop voting for parties and vote for the individuals. Nigeria is not a two-party state. It doesn’t have to be one or the more. We don’t have to pick the lesser of two evils. We can make a difference February 16th by electing someone with a heart for Nigeria, a heart for the people, a true patriot. I won’t tell you who; if you know, you know. Fellow young Nigerians, let’s do Nigeria a favor and vote right. Let’s vote in a lion of a president; one without an evil agenda or complacent attitude. We owe it to ourselves and future generations. I came to Nigeria a few months ago to explore some business opportunities. During the course of my stay, I’ve met up and run into a few friends; people I’ve managed to keep in touch with all these years. One of those friends, Onyew B*, has been a friend of mine for over thirteen years. During one of our many talks, she told me about an organisation she has working with – Quintessential Business Women Association (QBWA), under the Quintessential Young Leaders (QYL) arm. From what I understood, the aim of QYL is to prepare and train young people for leadership roles in various aspects business. However, the parent group, QBWA, is laser-focused on the development and empowerment of women and young people for business in the agriculture and solid minerals sectors. I told her my SME Advisory firm, Herança Financial, has clients in that industry, but I’ve never personally cared for business in agriculture. She tried to encourage me to consider it, but I wouldn’t budge. Last week, she invited me to a conference the QYL was organizing in partnership with QBWA and the Federal Ministry and Youth Development in Abuja. I was going to be Abuja that week, so I accepted. Friday, November 7th, I found my way to the National Centre for Women Development. It wasn’t hard to find, so I got there at about 8:35am. It was to start at 9:00am. To my surprise, unlike a couple other events, I had been to in my short time back, it started relatively on time – about 9:30am-ish. 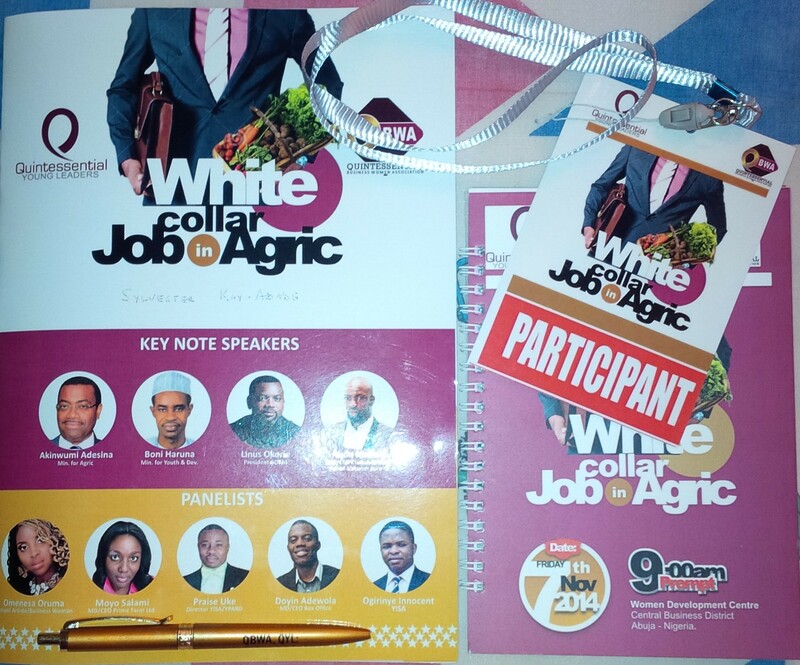 It was called White Collar Job In Agric. They meant business lol. Everyone got a lanyard with a participant card, plus a branded pen, folder and notepad. I thought that was quite impressive. They had ten speakers, but I could only stay for the opening speech (which Onyew gave) and the first presentation (which I was most interested in) on business in agriculture by a representative from the Small and Medium Enterprise Development Agency of Nigeria (SMEDAN). Before the SMEDAN representative began, there was a short charge by Shimite Katung, Founder of QBWA. She was quite electrifying lol. I could tell she’s very passionate about developing people for leadership as well as helping develop highly successful businesses in the Agriculture and Solid Minerals industries. The presentation was quite informative. I hardly get excited about things, but yesterday, the speaker piqued by interest. QYL hoped for five hundred attendees, but they made about half of that while I was there. To help out, I’ll share what I learnt about QYL and starting/owning a small business in Nigeria’s agriculture sector. Agriculture is a major branch of any economy, most especially the Nigerian economy. It has the potential to generate employment for up to seventy percent (70%) of the population. Unfortunately, Nigeria relies more on imports than being self-sufficient. Nigeria is at a point where the export of crude oil isn’t going to cut it anymore, and requires its youth to become agro-entrepreneurs. Nigeria is so richly blessed that each of its thirty-six (36) states has at least two unique agricultural products it can contribute to the economy – for both its populates and for export, but the opportunities aren’t being properly explored. The Nigerian agricultural industry has the raw materials to mass produce and export beef, cassava bran (garri), dairy products, fish, fruits, goat, groundnuts, grass-cutters, poultry, rice, snails, variety of vegetables, and waste-to-work materials. If you’re wondering, as I was, how successful a business in agricultural produce can be, here are some numbers we were given at the conference: Africa spends thirty billion dollars ($30,000,000,000.00USD) annually on the importation poultry products, and Nigeria spends fifty billion naira (N50,000,000,000NGN) on the importation of fish annually. That’s a lot of money in any currency lol. 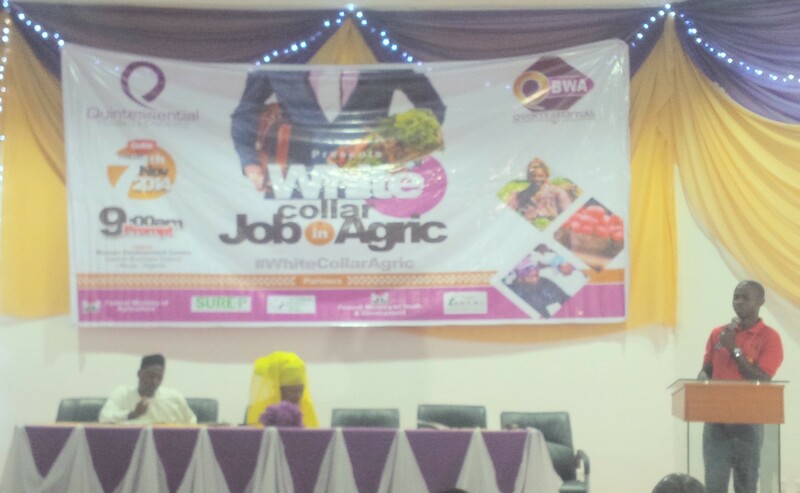 With all this potential, there is very little interest because of the stigma attached to agriculture in Nigeria. A lot of young Nigerians think agriculture and farming are synonymous, and they are not interested in being farmers; and there lies the misconception. Agro-entrepreneurs aren’t farmers; they are people who make money from running successful businesses in the agricultural sector. As was pointed out during the conference, there are different avenues available – beef production, cattle raring, fish farming, poultry farming, mechanized farming, development of devices and machinery for farming, frozen foods facilities, logistics and transportation, packaging facilities, and warehousing. I have a lot on my plate, but I think I wouldn’t mind investing in an agric start up, or partnering up with someone or a group of people looking to take advantage of the opportunities in the Nigerian agricultural industry. Apparently, even the government is giving grants to companies looking to develop quality agricultural products for local consumption and exportation.